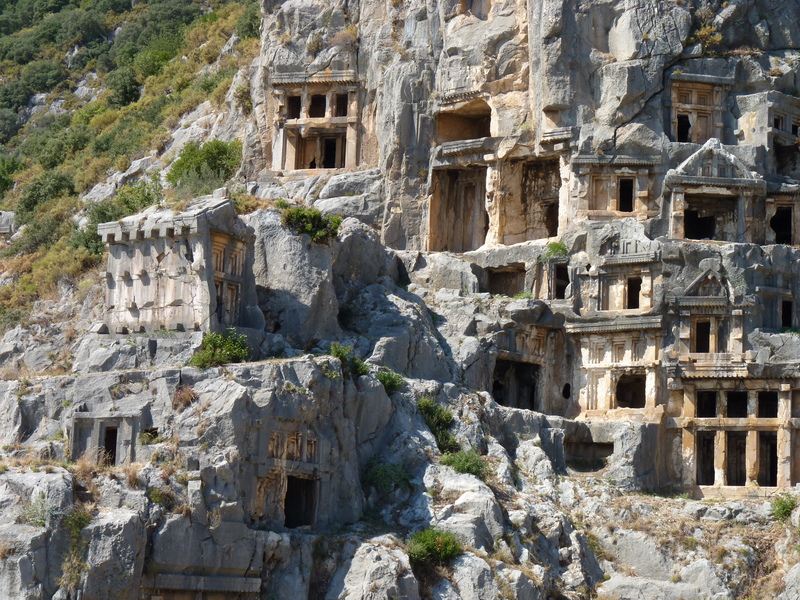 Demre, once known to the ancient world as Myra, was an important Lycian, Greek and Roman city, remains of which can be seen today when visiting on a crewed yacht charter along the southern coast of Turkey. While the ancient area now stretches out away from the silted harbor, the harbor remaining today allows for at least the ship’s tenders to come in for land transportation to the ancient areas. 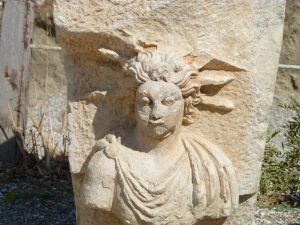 At the mouth of the Demre River, the harbor area drifts back along the river with ancient ruins evident as you drive along the riverside including the remains of a large Roman grainary. 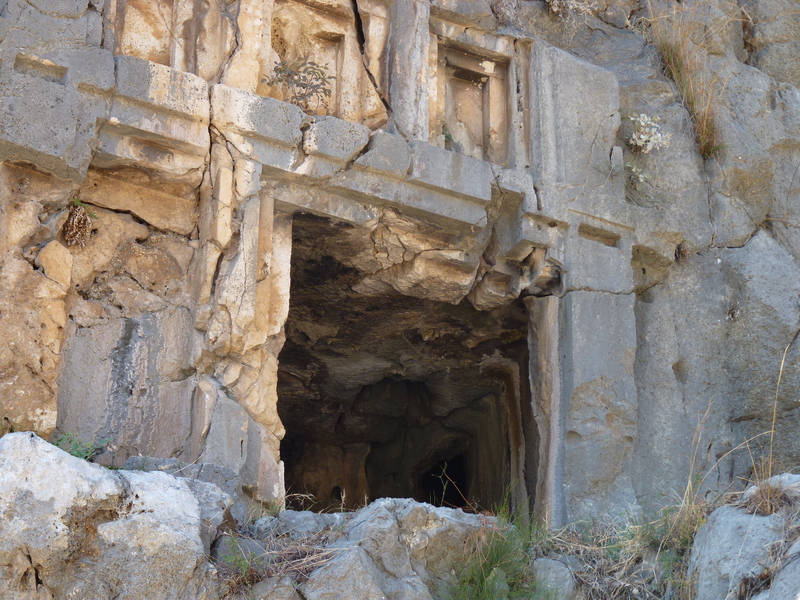 However for anyone interested in a show stopping display of Lycian cliff tombs reflecting the ancient art and spiritual world of the Lycian culture, there are several extraordinary areas of hand carved and built tombs left in the cliff sides in the Demre area of ancient Myra that should be visited while on a crewed yacht charter on the southern coast of Turkey. 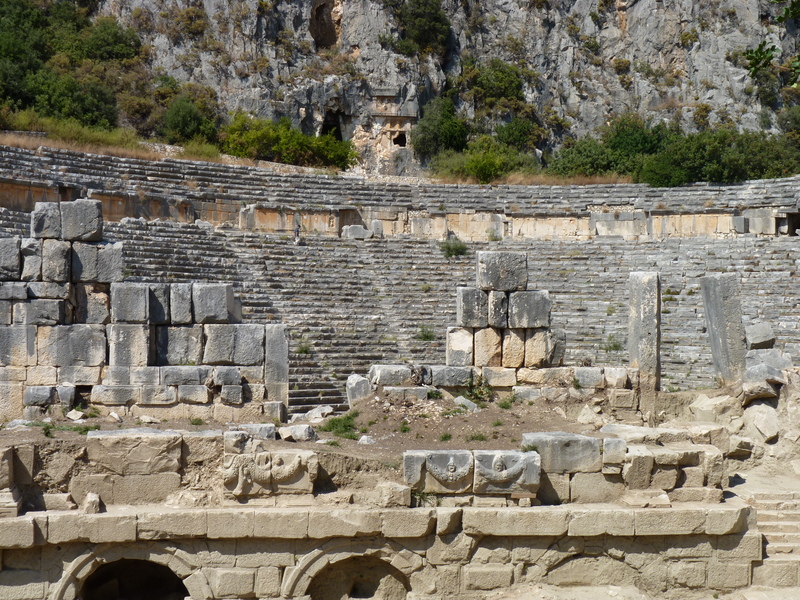 Remains of a Roman Myra is spread out in front of this spectacular cliffside display of Lycian tombs with a huge amphitheatre in the process of being restored. 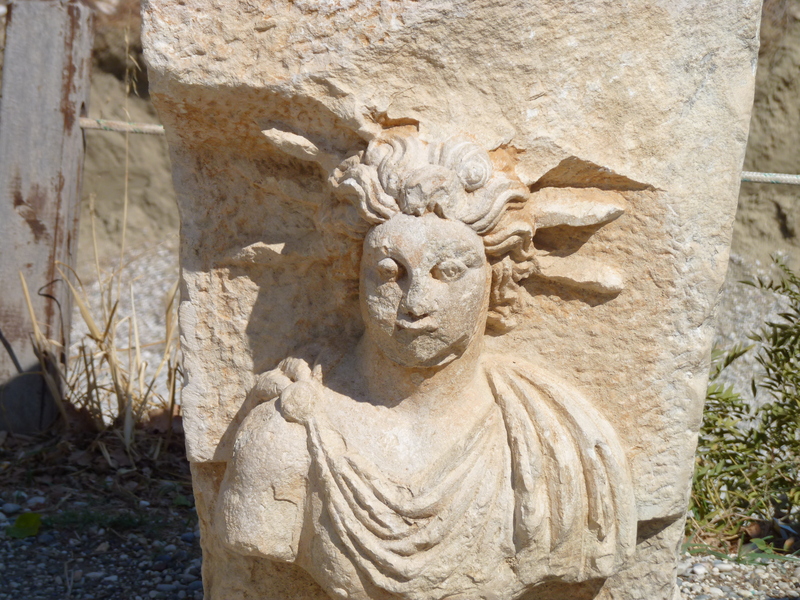 Scattered around the area are sculpted and other marble and granite rock pieces that are marked for future restoration. 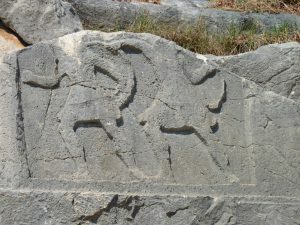 As you can see, when visiting, the rock carved art work displayed suggests a very wealthy and large city area at one time. The finished restoration of this Roman amphitheatre should be a spectacular and educational display of an amphitheatre of a large wealthy Roman city. 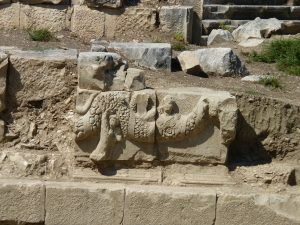 Prior to either Roman or Greek habitation of the area, Myra was a significant Lycian city believed to have been established at least by the 5th century BC. There are several cliff faces filled with Lycian tombs in a stunning display of this ancient civilization, with both the flat temple faced tombs and several free standing house tomb buildings. Many of the tombs are decorated with relief stone carvings and originally were painted in bright colors of red, blue and yellow. In reports even from as late as the 19th century, the tombs were said to be covered with bright paint colors, and in protected rock crevices on the tombs today, in some areas, these colors can still be seen. 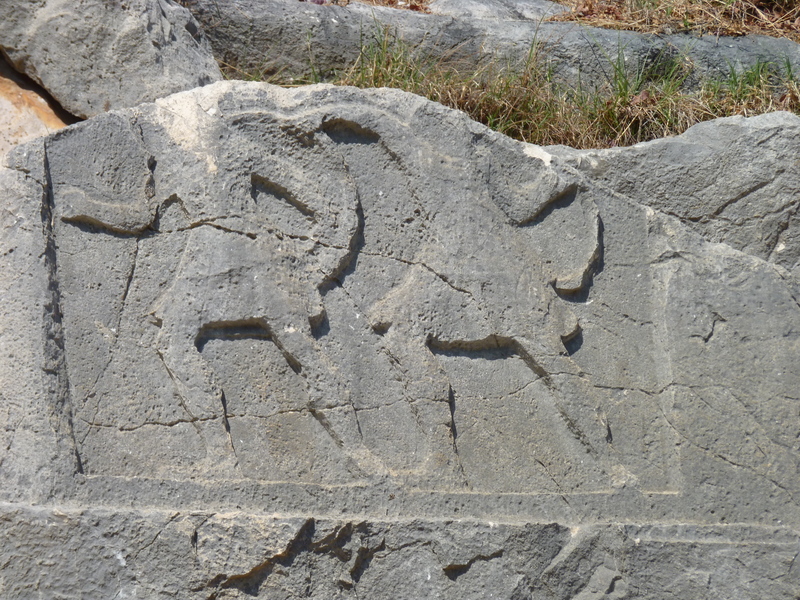 In many instances, the relief carvings depict the family life of the tomb holder, which provides an interesting snapshot of ancient Lycian life. 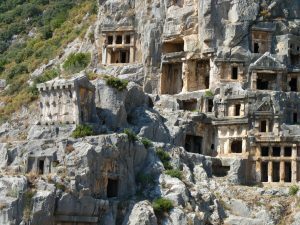 The Lycians, who held their ancestors in high regard, believed that departed family members were carried into the afterlife by a winged creature, and therefore, placed the tombs high up in the cliffs to speed that journey. Inside were often stone benches on which the bodies of the dead and various offerings were placed. Across the face of the cliffside temple façade tombs and temple house style tombs grooves have been found to suggest a large flat rock that could be slid across as a door to seal the tomb after each burial, but allow continued family use. 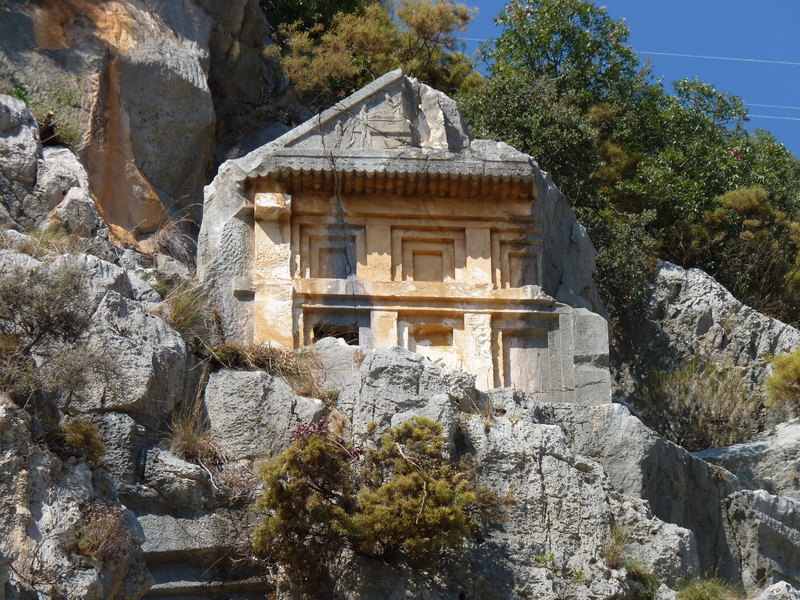 Today, virtually all of the tombs have been opened throughout the centuries by grave robbers and the contents are long gone, however the tombs themselves with the stone reliefs can still be seen as a resplendent display of Lycian culture and the quiet strength this civilization showed of family honor for their departed family members and ancestors those many long centuries ago. 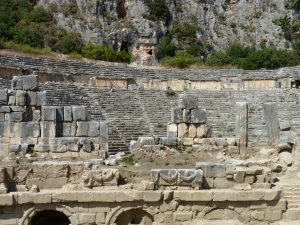 Along with seeing the slowly rebuilt large Roman amphitheatre, this site in Demre that was part of ancient Myra, is well worth visiting while cruising on a yacht charter along the southern coast of Turkey.